Hanging Gardens provides a comprehensive palette of systems paired with an array of proven products and emerging technologies that meet the challenges of the dynamic stormwater management industry. We collaborate with some of the nation’s leading sustainability firms resulting in some of the country’s most appealing and innovative designs. Hanging Gardens offers the highest value system and product solutions complementing our many potential funding opportunities that will combat your challenges in the constantly changing environment of stormwater regulations. Hanging Gardens is your representative that will steer your company’s real estate portfolio through the dynamic environment of stormwater management with an array of proven products and emerging technologies that will maximize your returns on investment. Hanging Gardens has developed the most comprehensive value based line of systems and products for the green infrastructure market that provides the design flexibility to exceed all of your aesthetic and performance requirements. Hanging Gardens provides the most complete tool set of products and services to increase your green infrastructure market share. Our training and support provides your team with the knowledge to ensure that your projects are implemented efficiently. Hanging Gardens provides you with the most expansive system and product offering suite specifically designed for green infrastructure for stormwater management. We will continue to assist your team with researched and proven emerging technologies that will assist you in the ever expanding bioremediation market. 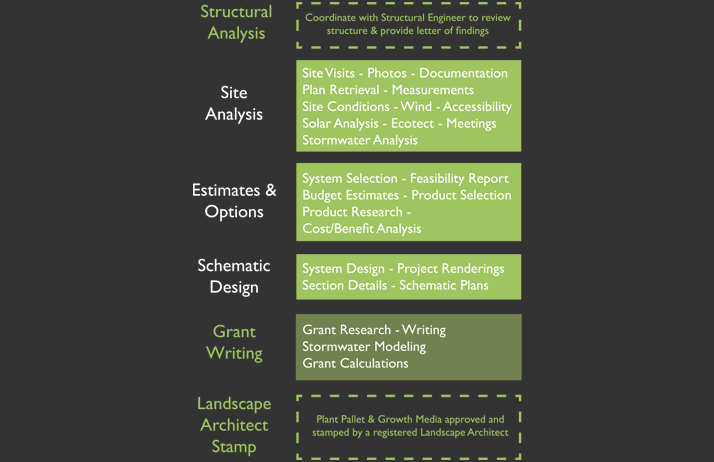 Hanging Gardens is the organization that will assist in maximizing your green infrastructure funding programs while ensuring the sustainability of implemented and future projects through our rigorous arsenal revolving around performance standards. Hanging Gardens specifies its systems with the most respected products throughout the world as well as searching for the most innovative technology to bring to market. If you have an exciting value-driven product, please find us on the contact page. Hanging Gardens is honored to have received the 2018 USGBC Transformation Award of Excellence for our work on the Milwaukee Public Museum Stormwater Entryway! Check out the Award Winners! Extensive vegetated roofs are lightweight systems designed with drought resistant plants that require significantly less maintenance and irrigation than their semi-intensive and intensive vegetated roofing counterparts. Hanging Gardens provides a complete array of extensive vegetated roofing systems that offer a variety of aesthetic, stormwater retention requirements and budgetary options. Please browse our extensive vegetative roofing systems to find the option that best meets your needs. The number one litigated construction trade in the nation is roofing and waterproofing. Now with the emergence of vegetated roofing as a more commonplace commercial application, the potential liabilities have been exacerbated through the installation of overburden on roofing/waterproofing materials. The use of water tests and thermal imaging on these covered and constantly moist conditions are no longer effective methods in determining the location of a roof leak or breach.rnrn	Leak Detection is the answer to minimizing your exposure to potential building damage, reduced employee productivity and provides the peace of mind that if you have a leak that it will be resolved in a quick and efficient manner. We offer both reactive and proactive systems that will pin point any leak as close as to 2” from the source. We recommend leak detection solutions to all of our blue and vegetative roofing clients. Additionally, it is a standard requirement to receive any Hanging Gardens blue or vegetative roofing warranty. We too understand the necessity to limit our own liabilities. Time is money: A statistically alarming amount of green infrastructure projects relating to stormwater are either value engineered out of a project and/or are problematic after installation. This is generally due to loose specifications and poorly vetted contractors. This encompasses plaza decks, vegetated roofs, porous/permeable pavers, bioinfiltration and stormwater collection and reuse systems. Wasted time = A lower return on investment for everyone involved. The reason for this is that these projects lack a green infrastructure industry expert that will guide their team to make the best economic decisions to meet your stormwater management needs. Hanging Gardens is that expert with over 50+ years of combined experience that ensures that sustainable systems with the greatest return on your investment dollars are always effectively designed and installed on your projects. We guarantee this. Semi-Intensive vegetated roofs are systems designed with an expanded palette of perennial and native plants that require more maintenance and irrigation than their extensive counterparts but less than intensive systems. With deeper growing media depths and the expanded plant palette, these systems offer much more design flexibility than extensive vegetated roofing. Hanging Gardens provides a complete array of semi-intensive vegetated roofing systems that offer a variety of aesthetic, stormwater retention requirements and budgetary options. Please browse our semi-intensive vegetative roofing systems to find the option that best meets your needs. Our waterproof membrane solutions provide durability, flexibility, compatibility with leak detection & prevention systems; as well ease of installation. What differentiates us from all other complete green roofing solutions is that we provide total system warranties that allow for ponding water. This enables our roofs to become stormwater capturing solutions. The use of green infrastructure; such as plaza decks, vegetated roofs, porous/permeable pavers, bioinfiltration and stormwater collection and reuse systems, for stormwater management is a component of the built environment that encompasses numerous design acumens and skilled trades. With that said, the integration of the components necessary to attain the highest value systems is a challenging proposition to ensure all that the designs remain streamlined and the installations are both effective and efficient. Hanging Gardens design integration division does not provide architectural design or engineering services. We support these services and design professionals by ensuring that the most effective components to achieve your project needs are utilized and all of the pieces are integrated properly. With over 400+ components available from Hanging Gardens repertoire of offerings, we assure that when your projects are released for bidding that you will be provided with details and specifications that will be clear, concise and result in consistent pricing that will add value to your projects. Intensive vegetated roofs are systems that provide the greatest variety of design flexibility through the deepest depths of growing media and the largest plant palette available of any vegetated roofing system type. The counter to intensive systems, is that they do require levels of maintenance and irrigation much greater than the extensive or semi-intensive options. In all actuality, it is very similar to the care needed for conventional landscaping. Hanging Gardens provides a complete array of intensive vegetated roofing systems that offer a variety of aesthetic, stormwater retention requirements and budgetary options. Please browse our intensive vegetative roofing systems to find the option that best meets your needs. Our root barriers prevent root penetration into the waterproof membrane. Dependent on the roof membrane and types of plant materials chosen for a project, we provide a range of materials that can be used as a root barrier. We offer LLDPE, and HDPE Root Barriers; each product has its own specific application. Is your development of design firm looking to integrate cutting edge stormwater technologies in an urban environment, but lack the necessary funds to make your project a reality? 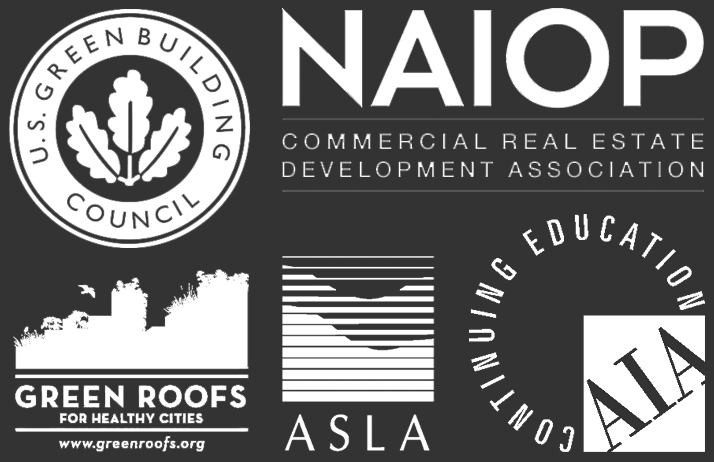 Regardless if you are in large metropolitan areas such as Chicago or New York or middle market MSA’s like Milwaukee, New Orleans and Seattle, national funding opportunities to utilize vegetative roofing, rooftop urban agriculture, brownfield remediation, stormwater harvesting/reuse systems, etc. to reach a higher standard of onsite stormwater management through performance green infrastructure are available. Hanging Gardens retains skilled grant writers on staff to be “bridge-builders” turning your dreams into a reality through incentive programs throughout the nation. There are millions of dollars available across the country to help further proliferate green infrastructure. Our mission is to help you utilize these opportunities. Hanging Gardens has the rapport that has allowed us to receive grant funding priority from grant advisors across the nation that will ensure you a high success ratio for approval of your grant application. In dense urban areas, many times the only means to effectively contain and control stormwater is to include the roof of the building as part of the stormwater solution. 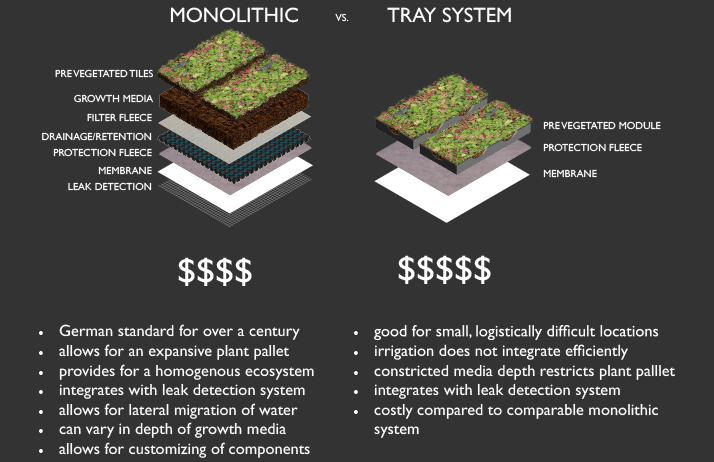 Hanging Gardens is well aware of this issue and has created two vegetated roofing systems that will allow to best meet your stormwater management needs. Additionally, since we are aware of the uniqueness of rooftops, structural loading capacities as well as other environmental circumstances, we also provide custom systems utilizing our many other products. Please contact Hanging Gardens design integration department (link to design integration) to receive further details on how we may assist you with your stormwater roof. The protection fleece should fully cover the waterproof membrane and/or root barrier/slipsheets to maximize its protective qualities. Roots are meant to grow into the protection fleece, thus intertwining the vegetated roof layers to create a superior stable system. A crucial factor for the health of the vegetated roof is the rot and pathogen resistance of our protective fleeces. This will allow it to endure through constantly moist conditions. Slope stabilization products allow for steep slope pitch vegetated roofing. We partner with Optigruen International which is the oldest and most trusted vegetative roofing product supplier worldwide and are accepted by engineers internationally. We are able to provide solutions for steep slope vegetative roofing up to a 5:4 pitch. Since the inception of Hanging Gardens, we have prided ourselves on education and providing choices to our clients. For the most part, Hanging Gardens does provide monolithic vegetated roofing systems, however as the most objective company in the vegetated roofing industry, we do also offer a modular or tray system as well. What we want to make clear is that like any of our products for stormwater management, we guide our clients to make the correct choice to meet their functional needs and budget. In regards to the later, more than product pricing is relative to determining what a final price for a project will be. Labor, crane, logistics, etc., are all factors when we help our clients determine what system is best for them. We take this into consideration every day when our team provides budgetary numbers to our clients; many times with multiple system offerings. We want you to make the right decision and we will direct you in the most objective manner possible for that to occur. Dependent on the design of the roof, there are different drainage needs. Because of this inconsistent design challenge, we provide a vast array of drainage products to ensure that the roof receives the required drainage. The determining criteria for drainage choices are: roof slope, accessibility, compressive strength, plant palette, and stormwater peak discharge delay. Adaptable to many growing regions across the U.S., the Hops Roof is a hearty semi-intensive vegetated roof that provides a dynamic living system for your facility. By integrating ballasted columns, in conjunction to the latest in green wall trellis technology, we can assist you in customizing your brewery space into a one-of-kind beer garden. Through combining hardscaping with greenspace, we can create the perfect combination of form and function to suit your needs in addition to providing valuable stormwater mitigation benefits. Drainage Mats and Drainage/Retention Boards are chosen based on roof slope, accessibility, compressive strength, plant palette, water retention & peak discharge delay requirements. Regardless of project need, we are able to provide an appropriate solution for your project. All of our products are recommended for flat roofs, lightweight and provide a reliable discharge of water. Specific to our drainage/retention boards, we are proud to provide the largest and most time tested line of high water retention and discharge delay drainage boards available. Filter fleece for vegetated roofing is particularly engineered for the harsh conditions of roof tops and plaza decks. In these constantly moist conditions in which the depths of growing media are significantly less than conventional landscaping, it is vital to have a proven product that will stand the test of time. For almost 50 years, the products that we provide have ensured that optimum conditions will prevail for the duration of your vegetated roof. Ease of install, function and customization are the three keys to an effective line of edge restraints for vegetated roofs. Regardless if your system is extensive, semi-intensive, intensive, agricultural or a retention roof, we offer the choices that will exceed your edge and separation needs for your vegetated roof. We provide engineered growing media for multiple purposes in numerous markets. We do this while continually providing consistent and positive results that our clients are able to depend on. Standards such as the FLL Guidelines and continual research are directly related to our successes over the past ten years. As when we started, we are still pleased to provide a complete line of growing media products that provide shorter establishment times, reduce maintenance costs and always offer an enduring base for a healthy and thriving Rhizosphere. Often used in tandem with vegetative roofing, particularly on intensive and semi-intensive projects, a pedestal paver system makes a smart stormwater-conscious addition. It allows for stormwater to drain underneath the finished surface and into the drainage retention board for unrestricted flow, while providing a solid, usable surface. Understanding that each design has its own specifications, Hanging Gardens offers the most advanced lines of roof deck pedestals to accommodate each project\'s individual needs. These product lines are leaders in their regions and are respected worldwide due to their advanced technologies. A product that provides low maintenance, high durability, and superior longevity compared to others in the industry, Skye Turf pulls together the highest quality materials and craftsmanship to help your project achieve a final look that turns heads. Our Skye Turf line offers a variety of thatch and color options, providing the most realistic look, and uses a built in weed barrier to keep intruding weeds at bay. When providing an artificial landscape product, we want to set the expectations for it to handle life\'s realistic events. Kids, dogs, spills, you name it, Hanging Gardens has brought you a line of artificial turf that can stand tall through it all. This lightweight system incorporates a superior drainage backing that allows for seamless flow of water through the product at a maximum flow rate of 250 inches/hour, facilitating any waste from life\'s messes to wash right through the product. Skye Turf is a perfect solution for both on grade and rooftop applications. Choosing the correct plant type is the first step to a successful vegetated roof. It is important to note your USDA plant zone, sun exposures of the planting area, potential wind exposures, irrigation logistics, and the pitch/slope of the roof. Time frames and maintenance burden are also key items to consider. Based on these plant characteristics, the correct plant palette can then be chosen. Hanging Gardens offers plant material for all vegetative roofing projects, regardless of their idiosyncrasies. We offer sedum cuttings, perennial plug varieties, fully vegetated sedum blankets, tiles and fully vegetated modules.